This week: a special interactive edition! Get your teeth into these tasty transport-flavoured treats over your lunchtime sandwich, and flick off a submission on the spot. Cheaper by bus, train and ferry? Changes are afoot in how much it costs us to use public transport in our region. Greater Wellington reckon the changes will get more people using public transport because fares will be more sensible and streamlined. (Hopefully they’re also inching towards more integrated ticketing – one ticket good for all public transport). Transport choices (or lack thereof) affect everyone, not just the immediate neighbours to a project. So just like Ada you too have the right to have opinions on initiatives outside your backyard! Here are some open right now. 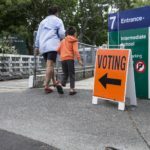 what options do you have travelling to vote? What transport choices do you want? What do you want for your kids? Transport policy’s a big deal and affects our daily lives. Nationally and locally, the politicians are promising (and not promising) some same-same and some very different offerings. So don’t forget to consider transport when you pick your winner and vote! Advance voting is now open and it’s all on!